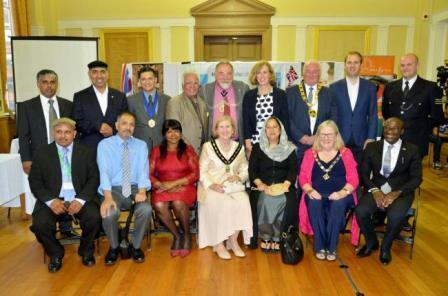 A MUSLIM society held a special ceremony at Kingston’s Guildhall to mark Eid, the celebration of the end of Ramadan. The Kingston branch of the Ahmadiyya Muslim Association hosted more than 200 guests for the dinner on Saturday, July 9. Representatives from numerous organisations from across Kingston attended, including Kingston MP James Berry, mayor Geoff Austin, Reverend Amanda Becky of St John’s Church in Kingston Vale, and Kingston police sergeant Rob Merritt.The dinner was preceded by a ‘peace exhibition’ during which charities from across the borough presented examples of their activities.During Ramadan, which this year ran from June 6 to July 7, Muslims across the world abstain from food and drink from sunrise to sunset in a display of faith. Share the post "Dinner and peace exhibition marks Ahmadiyya association’s Eid festivities"